Founders of Gloomhaven is a competitive tile-placement, action-selection, city-building game in which each player controls a fantastical race working to build the city of Gloomhaven and gain influence over its residents. This is a standalone game set in the same universe as Gloomhaven. 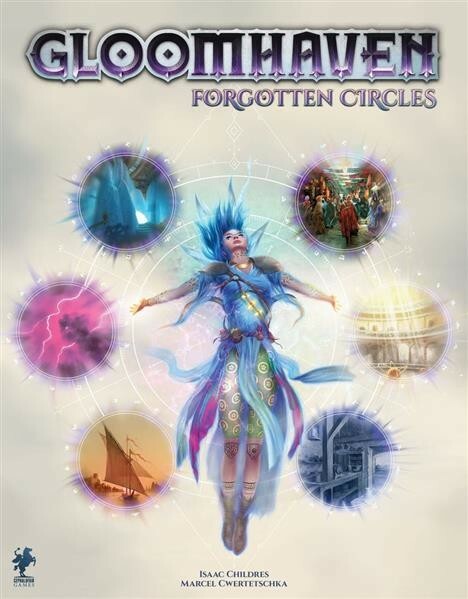 The events, however, take place hundreds of years before Gloomhaven and depict the original construction of the city. In Founders of Gloomhaven, players use action cards to place resource buildings on the map of the city, use these resources to create more advanced resources, then deliver them to proposed building sites to earn prestige. An individual player, however, cannot do everything on their own because they can import only a small number of resource types, depending on their race. To create more advanced resources, they have to work with other players. The game also features an auction mechanism in which players vote periodically to determine which new building proposals come out and where they are placed on the board. Players can also add the influence they ve gathered to increase the strength of their vote.